The United States Practical Shooting Association (USPSA) is a fun, exciting, competitive shooting sport that stresses safety while providing a venue to practice your handgun and pistol caliber carbine (PCC) handling skills. USPSA provides the shooter with a choice of divisions to compete in, providing a range of equipment choices. You do not need a high dollar "race gun" to compete in USPSA. You can compete in Production division with off the shelf, stock handguns such as a Sig 320 or 226, Glocks, Smith and Wessons M&P, or Springfield xDs. There is even a division for revolvers. 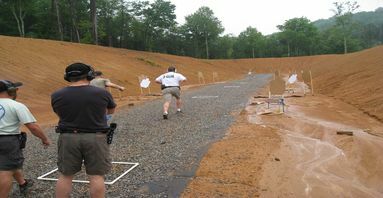 Detailed information about the various divisions can be found at USPSA.org. Along with a 9-mm or larger caliber gun, you will need a holster, enough magazines for 40-50 rounds of ammunition, and some magazine pouches. At our monthly matches, we typically have seven stages, with the round count per stage ranging from as little as 6 rounds to as many as 32 rounds. 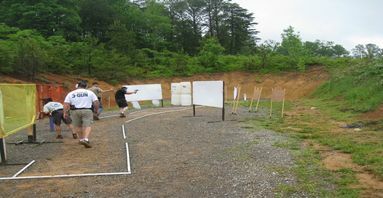 Our stages may include steel targets, paper targets, swingers, disappearing targets, and present a challenge for all shooters, regardless of talent level and experience. Plan on bringing a minimum of 200 to 250 rounds. We operate as an authorized and fully affiliated sub-club of the Oak Ridge Sportsmen's Association and follow all the rules as set forth by USPSA. We are a friendly group of folks and we love to introduce new people to our shooting sport. Come out and watch a match, or better yet, bring your gear and join in the fun! Remember that eye and ear protection is required - so bring your ear plugs and safety glasses. Before you participate in your first USPSA match, you will attend a new shooters orientation the morning of the match. You will have questions - our Range Officers and your fellow shooters will be glad to answer them all. Sign-in begins about 9:00am and we begin shooting after a safety briefing at 10:00am. Fees are $15 for ORSA members and $20 for non-members. Shooters under age 18 shoot free.